The Oceans Wonders DIY Coral Propagation Kits include everything to successfully frag or propagate hard and soft corals. Cutters and forceps are all made from surgical grade stainless steel. See full details for kit contents. This product is made from stainless steel and, while it is rust resistant, it is not rust proof. You will need to rinse the equipment in fresh water and dry properly after use to completely avoid rusting. The Oceans Wonders DIY Coral Propagation Kit includes everything needed to successfully frag or propagate hard and soft corals. Cutters and forceps are all made from surgical grade stainless steel. This kit looks decent, Just wish the description would have said the bone cutters are curved. Good quality tool set that I use regularly. I was impressed by the Reef Glue Gel which is good quality and a good amount. I will be ordering more of that. So far so good. Has not rusted. The glue is super strong and holds well in the salt water and dries fast. For the price I was expecting flimsy bone cutters and inferior scissors. Boy was I wrong. These are serious tools that will last for years. This kit has everything you need to start fragging. This is a must have for any SPS reefer, I especially like the scissors, they are very sharp and possibly the best pair of scissors I have ever owned. The bone cutting shears are also very nice, even though they are made of stainless steel, its best after use to rinse with fresh water and dry thoroughly before storage. Even if you dont they may become a tad rusty and hard to use, but after opening and closing them a few times they easily come back to normal use. They are also spring loaded which is a nice feature. I wanted something that was cost effective but still had all of the right tools. I currently have razor blades and a dremmel, but I need something that I could grab small items with and then a strong pair of cutting tools. 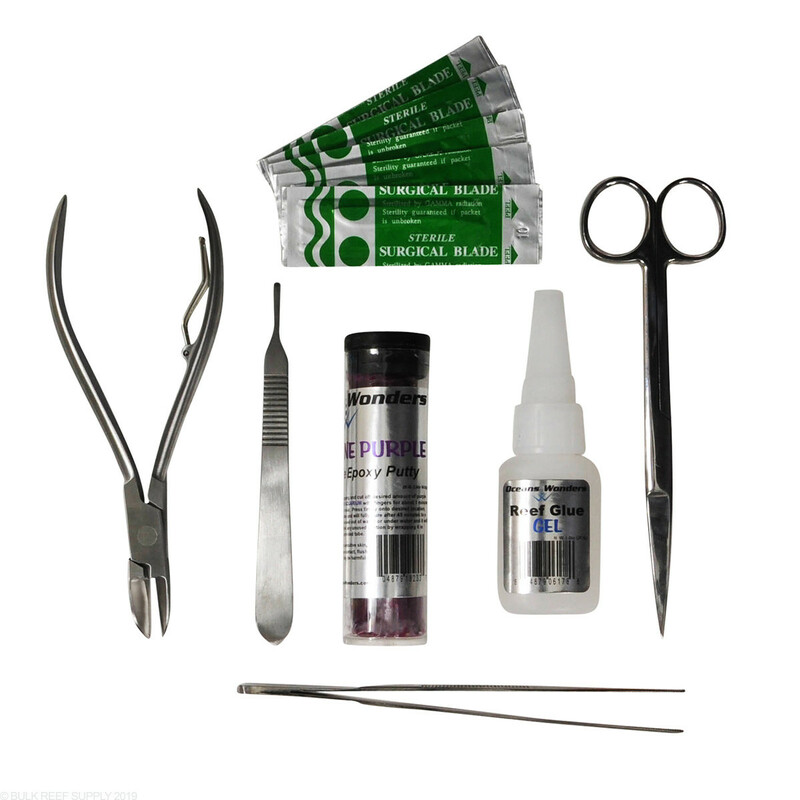 This kit fits the bill and I have use the snips many times and not a spot of rust or anything! This is a great value, ohh and the glue works great too! I was super stoked to open up this product and use all the tools for the first time. Having the proper tools to propagate makes things quick and cause less damage to the coral. Your corals will benefit from the use of these tools no question!